Celebrated as one of the Pike’s Peak region’s most unique and intimate fine dining experiences, The Mona Lisa Fondue Restaurant in historic Manitou Springs welcomes you to enjoy a relaxed fondue dining experience like no other. Cherish every minute of your evening while enjoying your dinner at one of the best restaurants for any special occasion. We take pride in offering top fondue dining for any occasion complimented with award-winning service. 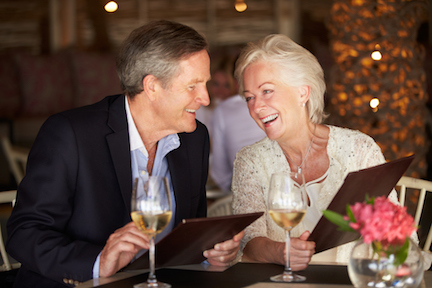 Whether you are celebrating date night and are looking for a romantic restaurant or an anniversary to celebrate a great accomplishment, our fine dining restaurant is here to serve you. Offering great tasting cheese and chocolate fondue, mouth watering meat and fish, and a wine & beer list that will have you craving more, there is something for everyone at the Mona Lisa fondue restaurant. We would love to serve you! Reserve a table with us today and enjoy a relaxed evening of great food, service, friends and loved ones. We look forward to serving you soon! Contact us today! Our most popular selection is our signature 4-course fondue dinner, featuring fresh and crisp salad with house-made dressing, mouth watering cheese fondue with fresh baked bread, fruits and vegetables, our entrée platters that will have you salivating while they cook on your personal tabletop Swiss Raclette grill, and finally a decadent chocolate dessert fondue. Our complete menu is available à la carte including vegetarian and gluten-free options. We also boast an award-winning wine collection featuring a diverse selection of top-rated wines from around the world and exclusive, limited-allocation boutique wines. With all we have to offer there is sure to be a wine that is bound to suit your palate. Escape from frantic, fast-paced living and step into the delightful setting of The Mona Lisa Fondue Restaurant where dinner is an experience intended to be savored and enjoyed. We invite you to come relax and linger awhile while enjoying your experience at our fine dining restaurant. Plan at least two hours to fully enjoy our signature 4-course fondue dinner experience. Our dining room opens nightly at 5:00 p.m. with our last reservation at 8:30 p.m. Reservations recommended, walk-ins welcomed. We look forward to hosting your evening of fondue dining in Manitou Springs. 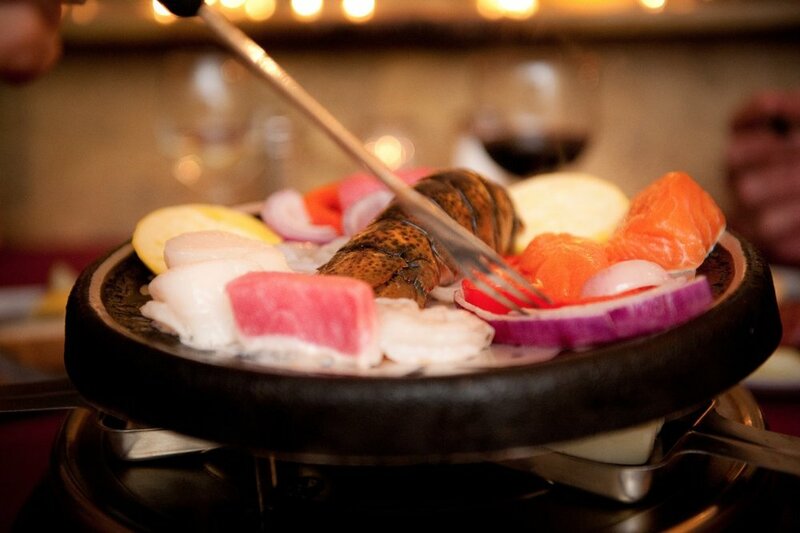 To enhance your fine dining experience with us, the Mona Lisa Fondue Restaurant proudly features table-top Raclette grilling for your entrée course. Raclette is a semi-hard cow's milk cheese popular in parts of Switzerland and France commonly used for melting. 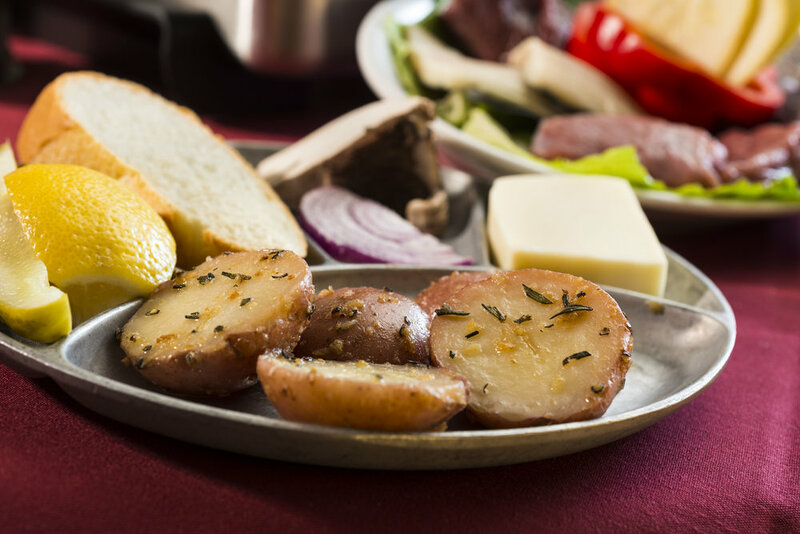 At The Mona Lisa, your entrée platter is served with a table-top Raclette grill where you'll prepare your selections of meats and vegetables to your liking. Slices of cheese are served in small pans known as coupelles and are placed under the grill for melting. Add the finishing touch to your entrée with our selection of handcrafted dipping sauces to complete your fine dining experience. VOTED "BEST PLACE TO CELEBRATE"
Voted as one of the best places to celebrate, The Mona Lisa Fondue Restaurant is proud to be a favorite destination for local residents, our military community, and the many tourists and visitors we serve each year. Whether it’s a table for two in search of a romantic dining restaurant or a room full of friends celebrating a special occasion of any kind!, we believe good food and good company are reason enough to celebrate. We're always happy to make your celebration truly customized for you. Downstairs Mona’s Wine Cellar wine bar features delicious appetizers, cheese and chocolate fondue choices along with an extensive selection of wine and beer. Mona's Wine Cellar is open every Thursday – Sunday from 4:30 p.m. to close with live music on most Saturday evenings. Enjoy our wine bar Happy Hour from 4:30 – 6:30 p.m. with $5 glasses of wine and 40% off all food. Or discover new favorite wines with our wine flight tasting experience guided by our in-house sommeliers. Mona's Cellar is also a unique space available for private events or parties. The Mona Lisa is your destination fondue fine dining experience in Manitou Springs. The Mona Lisa Fondue Restaurant has been part of Manitou and Colorado Springs tradition since 1995 with the same owners as your hosts for 23 years. We’re located right on main street (Manitou Boulevard) in this quaint vacation destination at the base of Pikes Peak. Manitou Springs is steeped in history dating back to the gold rush days. Founded as a scenic health resort, it’s still a quintessential tourist town bustling with locals and tourist alike, enjoying the vast array of shopping, fine dining, and amusements. We look forward to serving your special fondue dining experience when you visit this beautiful little city of the Pikes Peak region.